Property 8: Unique penthouse with a huge private roof teracce, close to the beach. Property 11: NO EXTRA FEES! ** Perfect Location, South Facing, Pool, Shops,Beach, No Car Req! Property 17: Luxury Penthouse, Close To The Beach Of Guardamar. Property 32: Luxury Punta Prima Apt in quiet secure gated gardens. Walk to sea, restaurants. 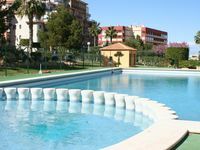 Property 42: 2 bedroom, 2 bathroom apartment, lovely pool and nearby beaches. Seafront. Property 44: Sunny two bed apartment close to the beach: a truly spanish experience.